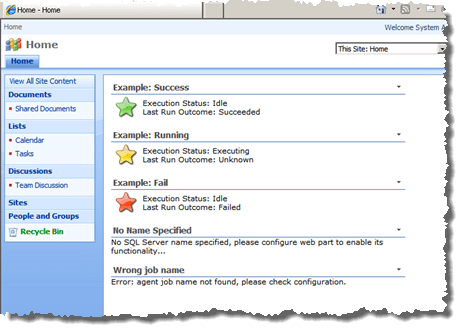 I have released a small web part for SharePoint that displays the current status of a SQL Server Agent job as a colored icon and displays status messages as text. Here is a screenshot of how it might look in a standard SharePoint 2007 team site. Sometimes SQL Server Agent jobs take some time to complete and other systems might rely on that job to complete before any useful information can be extracted from them. One example is slow import jobs done through an agent job. To be able to provide the user with the status means they know if the jobs are done or not. This is available for download and immediate use free of charge from the codeplex site, no programming needed if you are happy with the current implementation. The source code is quite uncomplicated and anyone should be able to rework it if needed. This entry was posted in Business Intelligence, SharePoint and tagged code, codeplex, jobstatus, SharePoint, SQL Server, SQL Server Agent, Web part on 2010-07-31, Saturday by Stefan Johansson.